My wife and I have three boys. Three hilarious, energetic, bouncing-off-the-walls, always hungry boys. They’re ages are six, four, and one. The photo above is a pretty accurate representation of our daily lives. We never know what’s going to happen next. 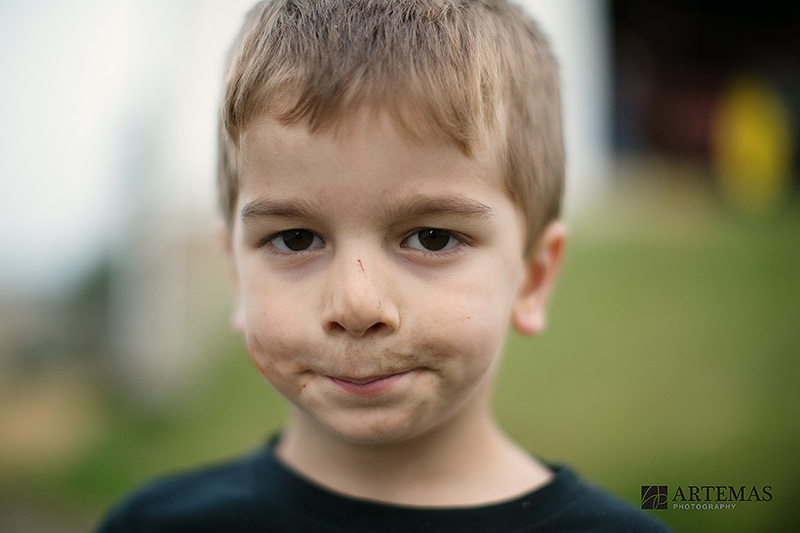 This photo is from a day at a friend’s farm and our four year old had just found dirt. Lots of dirt. And then he ate the dirt. At least that’s what I think happened, judging from the photo. I’m not positive because I didn’t actually see it happen. But knowing him, I’m sure he ate the dirt. Being self employed and a parent has it’s challenges. I’ve given up on the chase for balance between life and work, and now I’m learning to balance the chase. Some days are easier than others. Some days seem completely impossible. Some days I think my children are trying to kill me. At the end of it all, I have an awesome support system of people known as my wife and the boys’ grandma. They are both incredible and without them, I wouldn’t accomplish anything. My mom lives about 30 seconds from us and is probably the best grandmother on the face of the earth. She helps out at a moments notice. If I have to reschedule a shoot, or move a meeting, or head out the door at the last minute, she’s always there to help. My wife, who is a NICU nurse and works a crazy schedule, never bats an eye when I leave for work at 4:00 in the morning. There’s nothing but a smile when I leave for New York or Vegas for a photography convention. They are both rock stars and without them, I would not be on this incredible ride of photography. The best part of being a dad with three crazy boys? No matter how great the day was, no matter how horrible the day was, they are always smiling when I get home. And being able to come home at the end of each day and wrestle with them? Pretty much the best thing ever.